When your Millermatic 251 isn't working properly, it can be a bit frustrating, especially when you can't figure out what is wrong. By taking the time to observe how the MIG welder is behaving, you can quickly determine what might be the source of the problem. Common problems include no wire feed, overheating of the unit, stuck weld wire, and low weld output. Check to see if there is no weld output and the wire does not feed; if that's the case, ensure the line disconnect switch is on. If it is off, turn it on and see if that fixes the problem. If it doesn't, you may need to replace the building line fuse or you may have to reset the circuit breaker. Also check to see if the gun trigger has been disconnected or has somehow gotten loose and secure the connection. You can find the locations of these parts in the operations manual. Examine the digital meter display on the front of the unit. If HL.P 001 appears on the digital meter, turn the power off and then back on. If this keeps popping up on the meter, you may have to have it repaired by a professional. If HL.P 004 appears on the meter, you need to reset the message. A stuck wire can cause a short circuit and make this message appear, and you may have to manually remove it. You may also have to release the trigger to get the wire to loosen. Check to see if the Thermistor T, or thermostat, is overheating; look at the meters. If HL.P 002 appears on it, then the machine is overheating. Leave the machine on and let the fan run so that it can cool off. Do not use the machine until it has. After the unit is cool to the touch and HL.P 002 remains or shows up again, you may have an open Thermistor T and it will have to be repaired by a professional. Look to see if there is no weld output but the wire feeds. You may have poor metal-to-metal contact due to a loose connection. Undo the work clamp and then refasten it to the device to connect the work clamp. You may need to replace the contact tip as well. Take the welder to a repairman when HL.P 003 appears on the meters and there is no weld output but the wire feeds. Ask the repairman to check the main control board and main rectifier of the unit, as they may need to be replaced. Try connecting the unit to the proper input voltage or power outlet, and make sure that the input voltage jumper links are in the correct position. Low weld output can be caused by the input voltage being improperly connected, or by low-line voltage, which is caused by loose input voltage jumper links. Readjust the front panel settings when the wire feed speed is too high, too low, or just not working right. If this doesn't correct the problem, check to see if the correct size drive rolls are installed, then readjust the drive roll pressure and try feeding wire through the unit. Two other reasons why the wire feed speed isn't correct may be that the position of the input jumper links is not correct, or you may need to replace the inlet guide, liner, or the gun contact tip. Look at the wire feed. If the wire is not feeding at all, first try turning up the wire speed control to a higher setting. There may be an obstruction in the gun contact tip or liner and it may need to be cleaned. You can also try readjusting the drive roll pressure by changing it to the correct size drive rolls and then re-threading the weld wire. Check the digital meter. When the wire isn't feeding and HL.P 002 appears on the meters, this means that the unit is overheating. Stop working, and let the fan run to cool the unit down. If the message remains it needs to be taken to the shop for repairs. Examine the digital meter reading on the front of the unit. If HL.P 004 shows up on the meters, reset the message by releasing the gun trigger or removing a stuck wire. When HL.P 005 shows up on the meters, there has been a wire feed malfunction. Check the wire feed delivery system and remove the stuck wire. Check the gun trigger and leads. The gun may need to be repaired or replaced. If you try all of these and there is still no wire feed, take it to a service professional. If the fan motor is not running, check the fan-on-demand circuit. 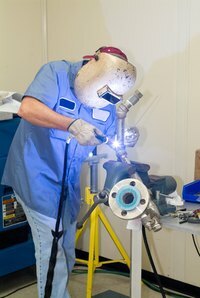 When doing maintenance on a MIG welder, be sure that it is unplugged and that all safety hazards have been removed. Wear proper equipment to prevent accidental burns or hand injury.